Magazine and Mix Trends colour forecast book. The Mix Trend Wall gives you a look into the colour trends for Spring Summer 2013. 2013. At the same time it will show you how the trend can be best applied to various materials and surfaces. which help you to understand how to use colour trends within the surface context. Carolina Calzada, Marketing and Sales Manager, Global Color Research and Mix publications. century to suit a lifestyle of understated luxury.’ Vanessa Brady, President SBID. and the feathered heads of reeds, gently whispering in the spring sunshine and underscores our love of mirrored surfaces. from natural graphic repetition as when angled they create infinite reflections. inspiration from the Bauhaus, the 1980s Memphis design movement and traditional Art Deco motifs. 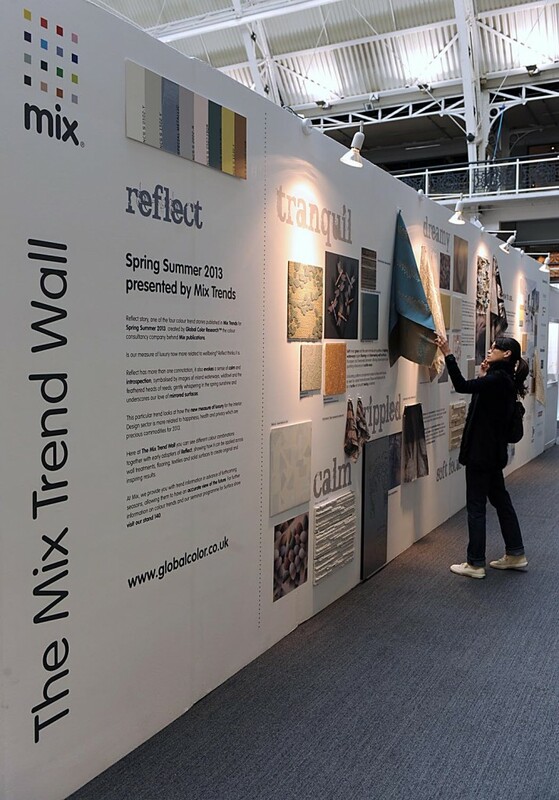 The Mix Team presented The Mix Trend Wall at the Surface Design Show this year – a creation stemming from the collaboration of Vanessa Brady, SBID President, and Global Color Research, the colour consultancy company behind Mix Magazine and Mix Trends colour forecast book. The Mix Trend Wall aimed to give a look into the colour trends for Spring Summer 2013. This installation really took you on a journey through the key characteristics of the Reflect story, one of the four stories for Spring Summer 2013. At the same time it showed you how the trend can be best applied to various materials and surfaces. The Trend Wall mixed inspirational imagery with samples of current products on the market and prototype products from new designers in order to understand how to use colour trends within the surface context. Reflect is a friendly trend, easy to apply into diverse environments from bathrooms to kitchens but always takes into consideration the focus of how the new measure of luxury for the interior design sector is more related to happiness, health and privacy, and which of these is the most precious commodity. Vanessa Brady designed some drawings based on the Reflect trend with her own personal interior design approach. ‘As an inspiration for this project I have created a house which was built as a gentleman’s residence in the1930s but was converted for the 21st century to suit a lifestyle of understated luxury,’ Vanessa said. The season that we have chosen for this year is Spring Summer 2013 and the trend we have chosen is Reflect. This particular trend looks at how the new measure of luxury for the Interior Design sector is more related to happiness, health and privacy, and which of these is the most precious commodity. Reflect has more than one connotation, it also evokes a sense of calm and introspection, symbolised by images of inland waterways, wildfowl and the feathered heads of reeds, gently whispering in the spring sunshine and underscores our love of mirrored surfaces. Reflect has subtle shimmering characteristics of sparkle as well as soft tinted greys and semi translucent qualities of rippling water to inspire flooring and shimmering wall surfaces.A mirroring effect is a key element of this trend not simply for reflecting qualities but for the inspiration from natural graphic repetition as when angled they create infinite reflections. Mix also covered the other three trends from Mix Trends Spring Summer 2013 in their seminar programme throughout the show. Crowd is a trend that reflects on the density and the diversity that come with any of the world’s major cities. Precious embraces our love for semi precious stones, not just the bling but the also the different contexts in which crystals manifest themselves and Block takes its inspiration from the Bauhaus, the 1980s Memphis design movement and traditional Art Deco motifs.